Chiara Translates – Good communication can make (and keep) you big. Reliable and timely translation services from English and Spanish (European, South American) into Italian. I specialise in marketing, technical (electronics, IT, environmental), and medical subjects. I only do what I know I can do so that you have the best result possible, always meeting the deadline agreed. It’s all about specialization and professionalism! If you want a language combination or a field of expertise I don’t handle personally, I can refer you to a trustworthy professional that can help you. Marketing texts need the right tone of voice and meaningful words to address and involve readers appropriately and convincingly and make real sense to a specific readership. My experience in transcreating texts includes copies in the IT, jewellery, travel & tourism, consumer electronics. It’s all about a translated copy with a creative twist! When translation takes cultural diversity into account, we call it localization. Rendering content, strings, commands literally from a language into another is possible but may sound meaningless to the target audience. Being based in Italy, I boast deep knowledge of its culture and language. Let me take good care of your content and tailor it for Italian readers. We are humans and we all make mistakes, right? But you want your text to read smoothly and naturally, basically an impeccable result that can go to print or online. I offer both services. Oral translation between two or more people that otherwise would not be able to communicate. I can let you communicate and sell your offering to a lead or convey your latest discovering to an audience of 200. I offer liaison interpreting for business meetings, one-on-one interviews, small groups meetings, trade fairs; simultaneous interpreting for conferences and meetings where a larger audience is involved; phone interpreting to enable communication between two business partners speaking different languages from different countries. Creation of relevant and valuable content that pulls customers / readers in. Not all copies are created equal. Having worked as in-house marketing & communications officer for 6 years, I know how to write effective and targeted copy for websites, newsletters, marketing materials, and articles. I craft content that makes a difference to your customers’ choices and your bottom line. 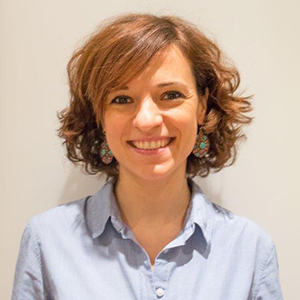 I’m Chiara Gavasso, a full-time translator working from English and Spanish into my native Italian. I set up my own translation business after 6 years of valuable hands-on experience as Marketing Officer in PR and Industrial Segments, where I learnt how to write a persuasive, effective copy. Now I build on that experience and draw from my linguistic creativity to produce compelling content when I translate marketing material, transcreate or write copy. I’m specialized in creative texts (marketing / PR translation, transcreation, and copywriting) and technical texts (mainly IT and Electronics). I also studied and worked hard to turn my interest in the medical area into a specialisation, with a focus on Pharmacology and Neurology. I provide accurate, honest, value-added services. Just the way I would like to receive them. I freelanced in Argentina for a few months. I completed a One-Year Postgraduate Course in Specialised Translation EN>IT in early 2017. A strong believer of lifelong learning and continuous professional development, I took courses in SEO, Marketing Translation, Effective Communication, among others. I am a ProZ.com Certified PRO in English to Italian translation. Chiara has helped us doing a very good translation. Besides, she has shown a great interest in her work. Chiara provided valuable assistance in translating one text for our project. Her translation was of a high standard and delivered punctually. I would gladly recommend her work. Very helpful, precise in her translations and always rapid in her response. We worked with Chiara for the ITA Press Conference of Sananda Maitreya's new album (The Rise Of The Zugebrian Time Lords) in October 2015. She was excellent, very professional and showed her terrific skills as an interpreter. We are looking forward to collaborating again with her in the near future and we highly recommend her. Send me a message and ask for a non-committing quote or any other info that is not here. Alternatively, you may use any of the contacts below. I always reply within 30-60 minutes. I’m based in Vicenza, north-east of Italy. No matter where you are – we’re just an e-mail away.